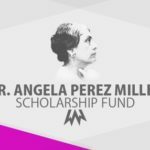 “When my late husband Dion Miller-Perez and I decided that we wanted to honor the life of Dr. Angela Perez Miller (Dion’s mother) by continuing her dedication to education through a scholarship fund in her name, Dion had the wisdom to turn to Latinos Progresando to make our desire a reality. 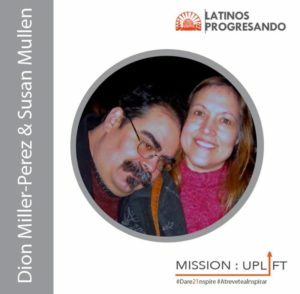 Latinos Progresando is truly honored to recognize Dion Miller-Perez and Susan Mullen as part of our 21st anniversary celebration. 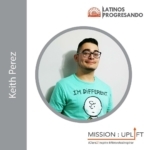 This dynamic duo are ardent supporters, not just of our organization, but of basically anything positive for the community. The late Dion was involved in the community and the progressive policies needed to create positive change, inspiring hundreds to follow his footsteps. 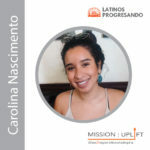 Susan has given generously of her time and great talent, including selling prints of her artwork and such to help fund LP’s scholarship fund, to support the aspirations of immigrant families.